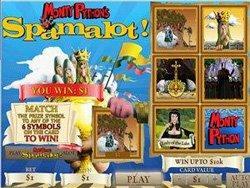 Join King Arthur and the Knights in this exciting playtech slot game called Spamalot which is based on the British Monty Python broadway show. It is a 5 reel 20 payline vide slot which features music from the original Monty Python plus voice overs from John Cleese and animations from Terry Gilliam and other Monty Python members. The chance to win 1 of 2 progressive jackpots in the Holy Grail Game. 3 or more scatter symbols will active 10 free games, in addition to the chance to play the Holy Grail Game. There is not 1 but 4 different bonus rounds that can be activated if a bonus symbol appears on reel 1 and 5. Storm the Castle Bonus – In this bonus you will receive cash prizes every time you manage to dodge a cow moosile thrown from the castle. None Shall Pass Bonus – Beat the Black Knight for cash prizes in this bonus game that shows King Arthur’s infamous “It’s just a flesh wound” scene in Monty Python and the Holy Grail! Knight's Who Say Ni Bonus – Pick a house that contains hidden shrubs and win some great prizes. Killer Rabbit Bonus – Watch out for the killer carrot munching bunny thats on the loose and win big bucks for blitzing him. A First for Playtech. A Game which allows 5 players to play at the same time. Join your friends in a Game of Fishing and get the chance of 2 bonus features too!